Buying a used car doesn’t have to be complicated. With around 40 million used cars sold each year, your choices can seem overwhelming. (1) But if you’re going to invest thousands of dollars in a vehicle, you’d be smart to take the time to find a reliable used car. Yes, they’re out there. You just need to learn how to find them. Of course, buying a used car doesn’t come without a few risks. That’s why you need to do your homework before committing to a vehicle. If you don’t do the necessary research, you may be paying more than you should for your car or, even worse, end up with a used car that isn’t reliable. Shop for a used car. Inspect the used car yourself. Go on a test drive. Take the used car to a reputable mechanic. Negotiate to get the best price. You can buy a used car with cash or by taking out a car loan. Guess which way is the smartest? We only recommend paying for a car with cash. Yes, that means you’ll have a serious dent in your savings, but you’ll skip the stress of spending hundreds of dollars on car loan payments each month! Isn’t that awesome? For example, if you borrow $10,000 for a car with a 5% interest rate, you’ll end up spending an additional $1,322.74 in interest. Not so affordable anymore! But before you lose hope, remember this: You can find reliable used cars in any price range. If you’re struggling financially, you can find a vehicle to get you from point A to point B for as low as $1,000 to $2,000. It may not be pretty, but you’ll get by. If you aren’t happy with the cars you can afford, remember that you can take all that money you save on car payments each month and stash it away for an upgrade. You’ll be debt-free and working your way to the car you really want. Once you’ve set your budget, you can find your ideal car. Not your dream car. Your ideal car. It’s the one that best fits your lifestyle and your reasons for buying it. Before you declare your loyalty to your favorite car brand, step back and examine the kinds of vehicles and what each was designed to do. Trucks, for instance, were designed to carry goods and heavy materials. So unless you’re hauling heavy cargo on a regular basis (you know: gravel, timber, bricks), don’t buy a truck. For a good commuter vehicle, stick with options that are compact and energy efficient, like sedans, hatchbacks or hybrids. Narrow down your choices with this quick checklist. Read through these statements and pick three that apply to your situation the most. Use your answers to help decide which kind of car is ideal for you. ____ I want a vehicle with plenty of cargo space. ____ I want a vehicle that can fit more people. ____ I want a vehicle with better fuel economy. ____ I want a vehicle that’s easy to get in and out of. ____ I want a vehicle that’s safe. ____ I want a vehicle that’s better for the environment. ____ I want my vehicle to carry heavy cargo. ____ I want to go off-road or on rough terrain. ____ I want my vehicle to be compact and light for city parking. ____ I want my vehicle to have towing capacities. As you decide on your ideal car, you will have to make some sacrifices. You won’t find a vehicle that does everything. Be honest with yourself about your wants and your needs, and think long-term about how you’ll be using your car. Want to Save a Little Extra Money? To make every dollar of your car purchase count, consider features you don’t need your car to have. Not just technology like in-dash GPS, Bluetooth connectivity, and backup cameras—but the basics like the number of cylinders in your engine. Six, eight, and 12 cylinders may make your car faster, but unless you’re hauling heavy cargo, stick with four. A 2011 Kia Sorento with six cylinders, for example, could cost around $8,977 to $10,875. (2) The same Kia with a four cylinder engine? $8,069 to $9,967. (3) Though it may not seem like a lot, you can take that extra $900 and put it toward your car insurance. Lastly, decide whether you need all-wheel drive (AWD) or if you can get by with front- or rear-wheel drive (2WD). If you live in the mountains or deal with lots of rain, snow and ice on your commute, you may need AWD. But it’ll cost you. So if you’re just driving in the city, stick with front- or rear-wheel drive. Bonus Tip: When you’re comparing different vehicles, don’t forget to compare insurance costs as well. Work with an independent insurance agent who can help you save without losing on coverage. Now that you know how much you can spend and what kind of car fulfills your needs, you can start shopping. But first, let’s talk about two places you should avoid. New car dealerships. Even though most new car dealerships sell used cars, they’re always more expensive. "Buy-here, pay-here" (BHPH) lots. BHPH lots refer to dealerships that not only sell cars ("buy here"), but also offer car loans ("pay here"). You’ve seen these places. They usually have multicolored pennant streamers strung between light poles and a twenty-foot blow-up gorilla shaking a SALE sign. Avoid these lots too. BHPH cars have multiple hidden fees, and they also usually have less than a 48-hour return policies. With a little more searching, you can find better used cars elsewhere. Here are six places to start your search. Carmax has a massive online inventory and a rigorous car inspection. 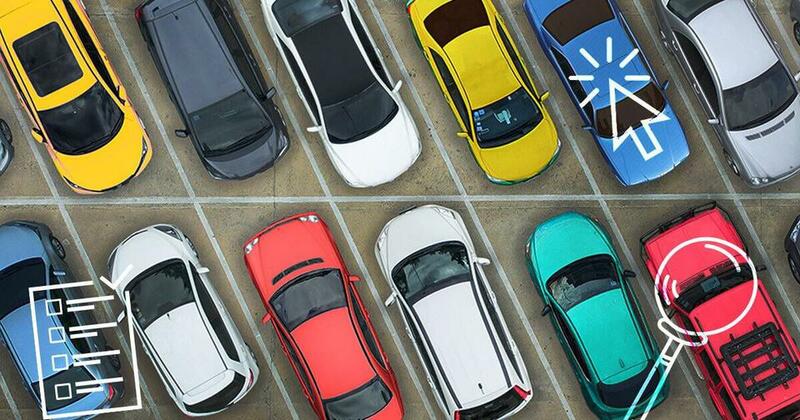 Though the prices are admittedly higher than, say, Craigslist, if you want to pay a little extra for security (and a solid warranty in case anything goes wrong), shop through Carmax. Carvana, like Carmax, has an enormous inventory and careful car inspections. The difference is that Carvana is completely online. You look at actual photos of used cars, pick one, and pay for it. Then, Carvana delivers the car to you. You have seven days to test the car, and if you don’t like it, Carvana picks up the car and refunds your money. Craigslist doesn’t charge you a purchase fee (like eBay does). It’s easy-to-use and convenient because you can search for cars by location. Legit sellers will always be willing to send more photos and answer questions. Just remember when you arrange to meet with sellers, always choose a safe public area. eBay Motors sells cars through online auctions and "buy-it-now" direct purchases. As you shop, you can also review comments left by previous buyers who bought from the seller. And, while you may end up paying for shipping for a car if you don’t find one near you, you can have the car inspected through eBay. "Showroom lawns" can be a good place to find a used car. You’ve probably seen a decent used car parked in someone’s front yard with a For Sale sign taped on the interior window and thought, How risky is that purchase? Yes, buying from a private owner can be risky. But sometimes the best deals are parked on turf. If you find a used car on a neighbor’s lawn or on the side of the road, follow Steps 4 through 6 to carefully ensure that it’s a reliable used car. Independent used car dealerships are also a smart place to look. We don’t want to exclude dealerships from our list. Sure, you have to negotiate with pushy salesmen, but you can definitely find a deal at a reputable dealership. Pick a long-established dealership with positive reviews from your friends or on Google and Yelp. All Our Used Car Buying Advice. One Checklist. Download your FREE checklist to get the best deal on a used car. We’ll even help you save on car insurance! Now it’s time to determine if the used car you’ve chosen is worth the price. Dig up all the information you can on the car so you can ultimately negotiate a better deal. 1. Start with Kelley Blue Book (KBB). KBB uses data collected from actual sales transactions and auction prices to give you an accurate price range for the used car. 2. Next, buy a Vehicle History Report (VHR). A good VHR costs about $50 and includes flood and accident history, ownership history, odometer readings when the car changed owners, and maintenance records. VHRs remove a lot of guesswork about the used car since it will show you if it has been in any accidents or has already spend a lot of time in the shop. Vehicle History offers a free basic report, but if you’re about to drop a couple grand on a used car, buy a comprehensive report from CARFAX. You’ll need your VIN number (usually found underneath the windshield on the driver’s side). Note: If the VIN number has been scratched off or removed, don’t buy the car. Chances are, the used car has been stolen or the seller is hiding something. 3. After that, determine the ownership cost—what you’ll spend to maintain the car (oil changes, new tires, fluid flushes) and what long-term repairs you should expect for the make and model you’re considering. You’ll also need to know the costs and availability of replacement parts since parts for some cars are more expensive than others. You can use Edmunds "True Cost to Own" tool to get a good estimate. 4. Then, find online forums focused on the used car. Nearly every model has a forum with threads sometimes stretching back a couple decades. Look for universal issues that owners have experienced with the type of car you want to buy. 5. Check the vehicle’s recall history. Don’t assume the seller has addressed a used car’s safety recalls. In fact, 27% of surveyed CarMax vehicles had an unrepaired safety recall, according to a recent auto safety report. (5) Check the National Highway Traffic Administration for your vehicle’s recall history (if it has one). 6. Finally, ask for an insurance quote. Used cars are normally cheaper to insure than new ones. In fact, a 5-year-old car is about 12% less expensive to insure than its brand-new counterpart. (6) If you already have insurance, ask how much your premium will change if you add another car. Work with an independent insurance agent who will do the shopping for you. Even if you’re not a mechanic, with the following list based on advice from the Department of Motor Vehicles, you can check for signs of damage and abuse. (7) While none of these things alone should stop you from purchasing the car (except for major damage, like a blown head gasket), a collection of these could certainly prevent you from buying somebody else’s car problem. Even if you’re not a mechanic, with the following list, you can check for signs of damage and abuse. Check the oil level and color. Oil dipsticks are located near the engine (usually a yellow stick). Oil should be light brown. If there’s no oil in the engine, that’s a good sign this is a bad deal. Check the color of the oil under the oil cap (located on the engine). If it’s milky—what some mechanics call "mayonnaise"—do not buy the used car. If the oil is milky, it’s mixing with coolant, a common sign of a blown head gasket (sometimes a $3,500 repair). Check the belts. Belts are located around the engine, sometimes on the engine’s side, so you may need a flashlight for this step. Belts should be smooth with no cracks. Cracked belts aren’t a deal-breaker, but you will need to replace them soon. Check the transmission fluid dipstick (usually a red stick). Transmission fluid should be pink or red. If it’s black and smells burned, that’s a bad sign. Transmission replacements are expensive, so if you find that the seller hasn’t replaced the fluid in a while, reconsider buying the used car. Check the level of the coolant. It should be between minimum and maximum. The coolant reservoir is somewhere near the radiator. If you can’t find the reservoir, ask the seller where it’s located. Warning: Do not open the coolant cap while the engine is hot or if the car is running. Check the brake fluid. Make sure it’s at the maximum level. Look in the car’s reflection for dents and scratches. Check the tires. They should all be the same (not mismatched), and they should have even wear across the width. Look for scuffs, cracks and cuts along the sidewall. Check the spare tire, too. Check the tailpipe. If it’s black, that means the car is burning oil—another bad sign. Open and close the doors as well as the trunk, fuel door and fuel cap. Make sure they work. Check the lights. Ask the seller to operate the turn signals, headlights and brake lights as you verify (outside the car) that they work. Take a deep breath: If the car smells musty, or if you notice mold under the seats, there’s a good chance the car has water damage that could lead to costly electrical problems. If there’s an air freshener, or if the car smells suspiciously perfumed, open the windows and leave them open as you test drive the car. When you’re done with the test drive, you’ll be able to detect the car’s natural scent. Check the wear on the steering wheel, seats and pedals. Lock and unlock all doors. Make sure they work. Idle the car and watch the temperature gauge. You don’t want to buy a used car that overheats. Make sure the radiator fans kick on when the temperature starts rising. When you’re taking the car for your first test drive, turn off the stereo and kindly ask your passengers to keep quiet so you can listen for any problems. Before you test-drive, decide on a route with hills, bumps and, yes, potholes. Even if you plan to use the car on highways and flat roads, test the car on rough roads to get a sense of its durability. When you’re taking the car for your first test drive, turn off the stereo so you can listen for any problems. Test the car on rough roads to get a sense of its durability. How does it feel on flat roads? Smooth or bumpy? How does it feel when it hits a bump or pothole? Does it rock violently? Does the car struggle to pick up speed? Do the gears change smoothly? Is the brake squishy or too sensitive? How does your body feel after the test drive? Was the seat uncomfortable? Does the engine sound smooth when you accelerate? Does the engine rattle, knock or grind when you idle? Are there vibrations or odd sounds under the hood when you accelerate above 60 MPH? Can you see out of the car easily? Do you have to strain your neck to check your blind spots? Does black smoke discharge from the exhaust when you start the car or accelerate? Is the RPM gauge consistent when you idle? Does it fluctuate excessively? Turn the air conditioning to a moderate setting. Do you smell oil burning? If the car has passed your personal inspection, good. Now let’s see if it passes the mechanic’s inspection. If the seller doesn’t want a mechanic to inspect the car, that’s a bad sign. Always have a mechanic inspect a used car, no matter the condition. A good mechanic will tell if you’re about to buy a reliable used car, or if it has foreseeable problems. Take the car to a reputable garage. Most car garages charge a flat fee for inspecting used cars. They’ll put the car on the lift, check for rot, rust and corrosion and tell you if the used car has severe fluid leaks. If you’re working with a private seller who doesn’t want you to take the car off his or her property, set up a mobile inspection. A mechanic will come to the car, perform the inspection, and print out the results. If a mechanic tells you the car has damages that outweigh its value, kindly tell the seller you’re no longer interested, or use that knowledge to lower the asking price. Everything you’ve learned about the used car in Steps 4 through 6 you can now use as ammunition to negotiate a better deal, if you have good reasons to believe the seller should lower the asking price. Negotiations can be tough for people who don’t like to be confrontational. Keep your nerve with these three tips. 1. Bring your research to the table. Let’s say the seller wants $3,000 for his used Volkswagen Jetta. You look on Kelly Blue Book and discover the average price range for that Jetta is $2,800 to $3,000. Okay, so the seller wants the upper part of that range. Let’s also say you discovered that the tires are bald, a headlight doesn’t work, and the back seat has some wear. Your internet research turned up an online forum where you learned that this model has problems with radiator fans. But, according to your VHR, no owner has ever replaced the radiator fans. Bring this research to the seller—factor in the cost of tires, a headlight and a radiator fan—and offer a lower price. Tell the seller you’ll be paying for your used car in cash—just don’t reveal how much cash you have. When sellers sniff green, they’re more likely to agree on your terms. If the seller doesn’t budge, you can walk away. You have the buying power. More often than not, they need your money more than you need their car. Hey! Congrats on the new-to-you car you just bought. Nobody expects an accident—which is why you need to be insured the moment you start driving. With so many variables surrounding the types of car insurance available, it’s easy to spend more money than your coverage is worth. To make the right choice, pick an expert who can answer your questions, run the numbers, and help you compare rates. Dave’s recommended insurance Endorsed Local Providers (ELPs) are independent professionals who work with insurance companies to help you find the right coverage at the right price. Make sure you and your family have the coverage you need to protect you and your car. Find your ELP today! If you’re a parent, you know the financial reality behind owning a car. So how do you make sure your teenager’s car doesn’t wreck your budget (or your teenager’s budget)?